Head coach Mike Tomlin didn’t invoke is “We don’t add style” points dictum in his press conference following the Steelers 20-15 win over the Detroit Lions. Tomlin’s “We don’t add style points” is simply another variation of Bill Cowher’s “It wasn’t pretty, but we found a way to win.” It’s a reminder to his team, to the press and to the fans that all wins in the NFL are created equally. The reminder is often necessary, given the number of fans who’re really to summarily fire Tomlin and/or Kevin Colbert after anything less than a double digit win. But perhaps its fitting that Mike Tomlin didn’t use his “Style” points reminder, because given the pat the Steelers used to secure victory, perhaps a few style points are in order. The Steelers went to Detroit as favorites which should have served as a warning sign. Mike Tomlin teams get too often tripped up by trap games. Following to uninspiring wins and 2 ugly losses, plus a strong win against the Ravens, Tomin’s Steelers had won hard fought contests over the Kansas City Chiefs and Cincinnati Bengals. Classic flat(ulence) spot for the Steelers, who are 0-5 under Mike Tomlin when traveling to an NFC team after two AFC wins that include a divisional win. The bullet points above add up to a net 14 point swing in Detroit’s favor and a lot of 3rd and long situations. Normally, those types of numbers come back to you on the score board when the clock reaches zero. But, if 8 games into the season the Steelers offense still lacks the potency everyone expected it to demonstrate, it nonetheless showed resiliency. Antonio Brown didn’t make many fantasy owners happy, but he did convert third downs when it counted. Jesse James came up with a couple of key receptions, albeit on drives that ended in turnovers. Le’Veon Bell moved the chains late in the game, and with Martavis Bryant on the bench, JuJu Smith-Schuster served notice to defensive coordinators that the Steelers can make them pay by doubling and tripling Brown. The efforts of the Steelers offense and particularly the emergence of JuJu Smith-Schuster as a real threat were necessary for victory. But they weren’t the story of the game, and that isn’t the reason why style points should be awarded. In days of old when knights were bold and you wanted to protect your gold you surrounded it with a stone wall. If someone wanted to take that gold, they had to either scale the wall with hooks or ladders while dodging slings and arrow. When that failed, your only other choice was to force your way in. The days of battering rams, draw bridges and flaming pitch are no more. But perhaps football gives us their modern day equivalent – the goal line stand. It says here that Keith Butler didn’t enter the game intending to spot Matthew Stafford over 400 yards of passing. But an on looker from Mars might be forgiving for assuming that Butler’s plan was to yield the first 80 yards of the field, only to break the Lion’s will inside the 20. Because that’s just what the Steelers defense did. Excluding field goal attempts, the Detroit Lions ran 17 plays from inside the Steelers 20 including 9 from inside the 10. Looking at the play, it’s difficult to determine which is more impressive, Hargave’s play or the look of utter disbelief on Jim Cadwell’s face. If you give even an average NFL team 17 shots at the end zone from inside their own 20 – at home – and they’re going to come away with a couple of three touchdowns. The Steelers defense didn’t yield a single touchdown. 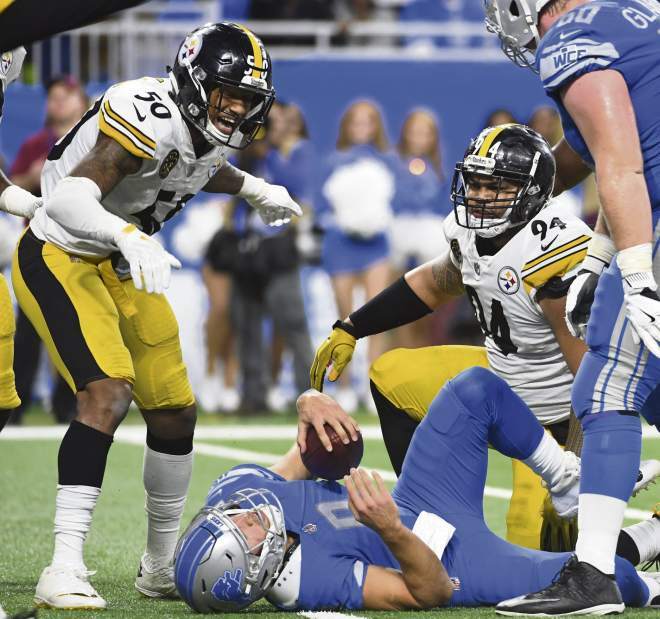 The NFL won’t award any extra style points for Pittsburgh’s defensive performance in Detroit, but perhaps it should. Against the Chiefs and then the Bengals, the Steelers defense put in stealer 1st and 2nd half efforts. Against the Detroit Lions the Steelers defense went into bend but don’t yield a single blade of grass mode in the Red Zone. While you never want to see an opponent march down the field with video-game like efficiency, getting tough inside the 20 is perhaps the greatest defensive asset a football team can possess. Against the Detroit Lions the Steelers defense proved it can deliver in the Red Zone. At the end of the day, the NFL won’t award any style points for that, but shut down ability in the end zone is a priceless commodity that could prove to be priceless to Pittsburgh down the stretch. This entry was posted in Steelers 2017 season and tagged Antonio Brown, Artie Burns, Ben Roethlisberger, Darrius Heyward-Bey, Eli Rogers, Javon Hargrave, Jesse James, Joe Haden, JuJu Smith-Schuster, Keith Butler, Le'Veon Bell, Martavis Bryant, Mike Hilton, Mike Tomlin, Pittsburgh Steelers, Ryan Shazier, Sean Davis, Steelers vs. Lions, Tyson Alualu. Bookmark the permalink. It is impressive to see how Vince Williams bounces out over the human pile after deliver the hit.